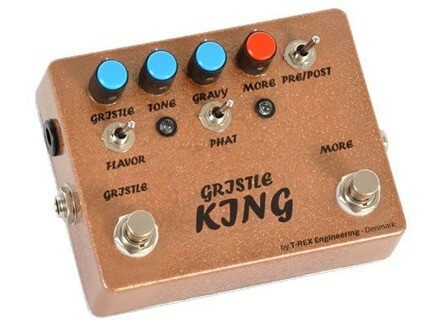 Gristle King, Overdrive pedal from T-Rex Engineering. The Gristle King is a combination of the features of the DGTM and the Luxury Drive, offering a variety of boost and overdrive possibilities. Besides the controls that are also appearing on the DGTM (Gristle, Tone, Gravy and Flavour) and the Luxury Drive (MORE), the DGTM has two new toggles (Pre/Post & Phat). 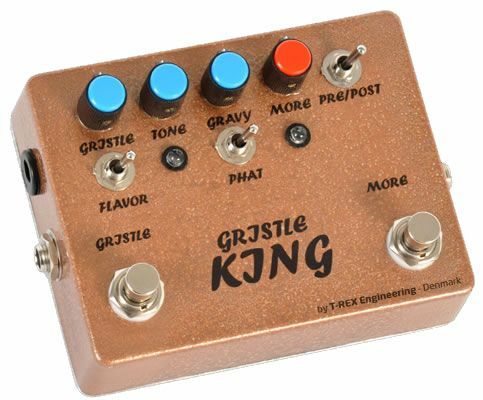 The Gristle King gives you two effects, plus extra tonal possibilities, in one compact unit. The Gristle pedal line was born in the US as a result of the cooperation between technician Tim Jauernig and guitar player Greg Koch. T-Rex adopted the Gristle pedals and they are now official members of the T-Rex pedal family. For more information, visit their web site at www.t-rex-eng.com. VHT/AXL Custom Shop To Be Launched Mere months after acquiring the VHT brand name, AXL Guitars is about to launch an amp custom shop under this prestigious name. T-Rex Engineering Diabolic Gristle Tone Manipulator The DGTM is designed to bring forth an overdrive that has both "vintage crunch" and "modern tweak" according to T-Rex. Liquid Metal Guitars & H Music The Liquid Metal Guitar Company (LMG) has announced it's first shipment of guitars to H Music for distribution in Australia and New Zealand.